This is part 25 of a 31-part posting of my journal entries and photos from one of the greatest experiences of my life so far--a month-long mountain climbing trip to the Atacama Desert area of northern Chile and Argentina, which included summiting three 6000 meter peaks (~20,000 feet). To view all the entries in this series, check the posts labeled South America. I fell asleep almost instantly and slept really well through a long night, making up for the lack of sleep last night. I didn’t get up until 8:25 with the sun already well up and shining on the tent. We had our usual breakfast of cold cereal and I was feeling surprisingly good. I have been blessed with near perfect health for this trip. 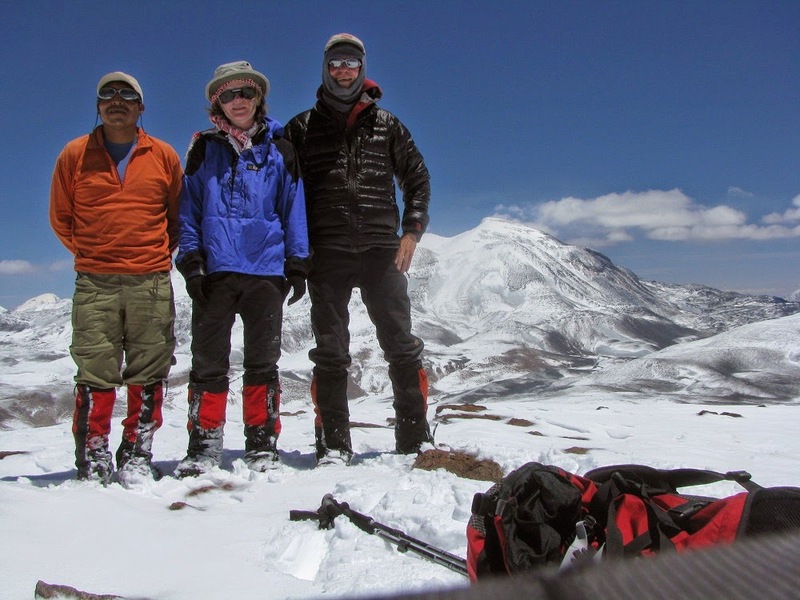 We decided that Thom and Barry would go with John and attempt what might be a first ascent of a remote and obscure minor peak of 6000m+ height a few miles northeast of Medusa. With no formal name they’re just calling it Medusa NE. Note: as it turns out they were apparently the first people ever to climb that peak. They would do that while Damian would guide Phinella and I up Volcan del Viento: a 6000 meter peak south of camp and importantly much closer to camp. After breakfast we packed up and headed out at 9:30. The other group left a bit later. We had beautiful, in fact perfect weather with sun and calm wind, but the snow conditions made this a very challenging ascent. It was both deep and crusty. 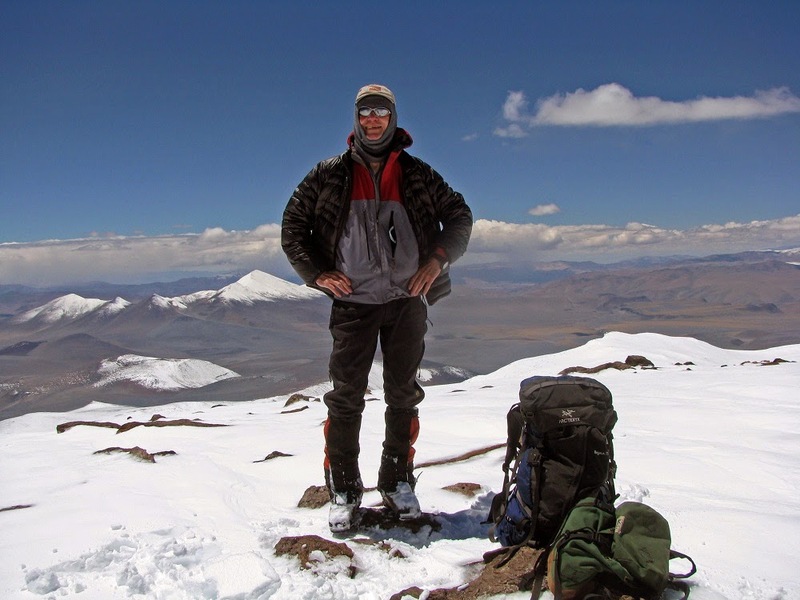 Damian blazed the trail most of the time—I did a bit of leading—often through knee-deep snow. Near the summit it was thigh-deep: 2 feet at least. We got to the summit at 1PM and enjoyed panoramic views under clear sky, calm wind. We spent half an hour on the summit. Here’s the three of us, Damien, Phinella and me with Ojos behind. 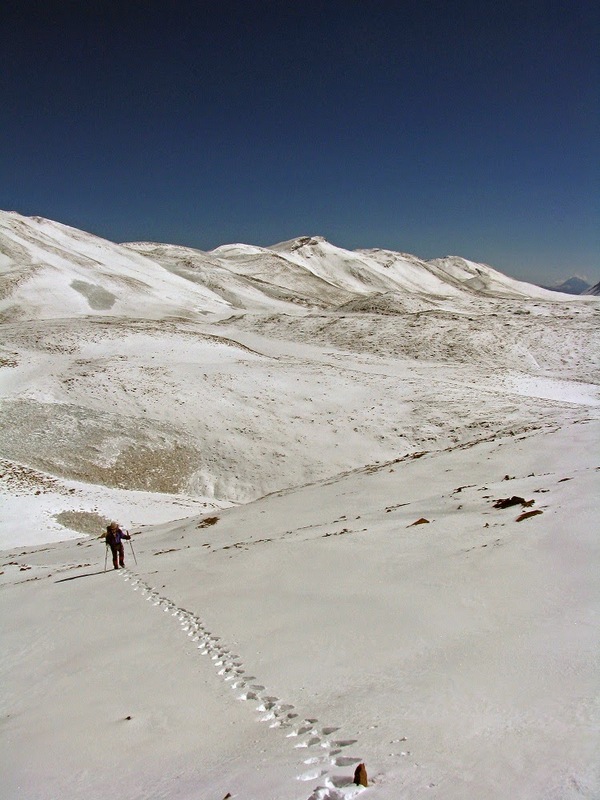 We descended to the col between the main and lower north peaks for lunch, again in calm conditions. We reached base camp at 2:45 and lounged around waiting for the other group to return. I got out my notepad and caught up on my journal after snacking some. That was done at 3:40PM. I then rested and read Silmarillion some and relaxed through the afternoon. Damian started preparing dinner at 6PM even though the other three hadn’t returned from their trek yet. They arrived at 6:30. The up-down terrain, snow and distance had simply been more than they expected. But they had made it to the summit of the Medusa NE peak. We had supper and chatted. The evening was fairly nice until a bit heavier snow moved in (It had been spitting snow most of the afternoon with thunder occasionally off to the NE). I retreated to my tent to finish dinner, then read Silmarillion again until some excitement outside diverted my attention. I watched the drama unfold through the air vent in my tent. It appears that three Argentineans, expecting a mule to have delivered a black duffel bag here, arrived without it. So they were stranded here without tent and sleeping bags and other critical equipment. One of them seemed pretty dazed and underdressed. I suspect he was close to hypothermia. John offered them some hot tea and then Thom moved from his tent into the main leader’s bigger tent that could sleep three people reasonably comfortably. The three Argentineans then snuggled into Thom’s tent to endure the night with what they had (three pretty full back packs so probably extra layers of clothes). Everybody settled in and got quiet as it got dark around 9PM. I had been peeking out for a long time, then I warmed myself up in my sleeping bag for a few minutes and then caught up on my journal. At 9:20 I read Silmarillion some more, reading one of the highlight chapters in the book--the one about Beren and Luthien. I finished the chapter about 9:45 and went to bed.